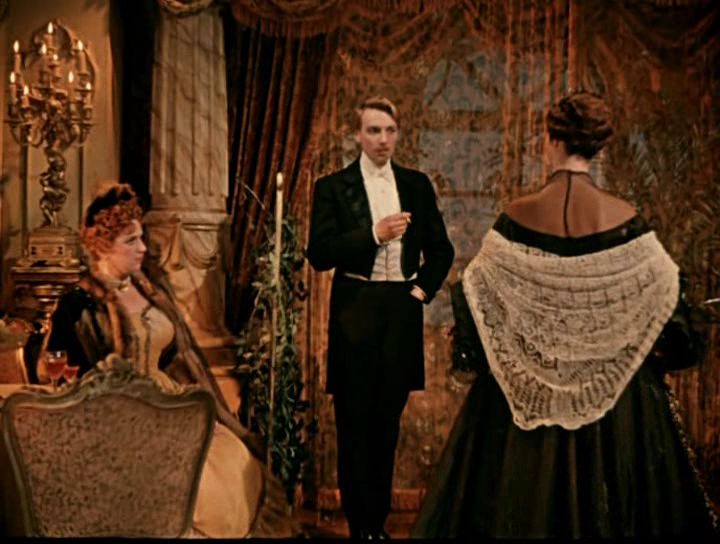 SYNOPSIS: Upon Prince Myshkin’s return to St. Petersburg from an asylum in Switzerland, he becomes beguiled by the lovely young Aglaya, daughter of a wealthy father. But his deepest emotion is for the wanton, Nastasia. The choices all are forced to make lead to great tragedy. In the period 1955-60 some absolutely incredible movies were made in the Soviet Union. This is no exception. Based on the classic novel, the script of course holds masterpiece quality. Visually, it’s also a masterpiece. The music is one of the most dramatic soundtracks I’ve heard. And not least, Yuliya Borisova in the role of Nastasia Philippovna gives the most charismatic acting performance I’ve ever seen. Throughout the movie I simply couldn’t wait for her to get into the frame again whenever absent. I’ve never ever been this hypnotised by an actor or an actress before (and I’ve actually given that careful thought). The other actors also give stellar performances. As the events unfolded, I felt this movie pushed the script to its ultimate limits. At the end, you will find yourself filled up with uncontrolled emotions that you don’t even know the name of. The movie is so dramatic that some people may find it unrealistic, but I assure you: these characters are out there in the real world, and this play may have relevance to anyone’s life. At some point, most people with brains will seek out this story. My tip is, don’t read the book. Don’t see any theatre play or movie based on it but this one. Though the movie may take a lifetime to find – *it’s worth it*!